Deb's Cup of Tea: Now what to do? So the football season effectively ended for Iowa today with their loss to Ohio State. Oh we'll still go to a bowl game. Bowls know the Hawkeye faithful will follow the team pretty much anywhere in the post-season. All that is left is Minnesota and the season is history. 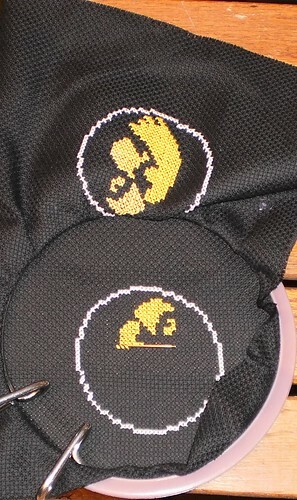 I finished a gnome and have started on the Hawkeye project to the left. It's been fun to sit and cross-stitch, to go through the many magazines and leaflets I've accumulated over the decades and think, "Oh x would like this!" and then wonder how I could get it done. In spite of the number of "what the..." moments my Hawkeyes provided me, the time to sit is probably the most important. I'm not real fond of pro football but I may start watching that or I should see if the DVD player works and I can watch movies while stitching. Mija and Pilchard beat a quick retreat out of the living room with Iowa's 2nd quarter interception of Ohio State. This has been a learning season for them. I didn't watch basketball last year so a whole year went by without my cheering maniacally. It's something they have to get used to. They chose to go take a nap, only coming to check on me when I went into the kitchen to wash dishes during commercials or half-time. I have quite a few things to do tomorrow, but I think I will make room for more stitching.